Arthur Shen is the only player in the tournament to have played all decisive games. The streak continued once again on round six! 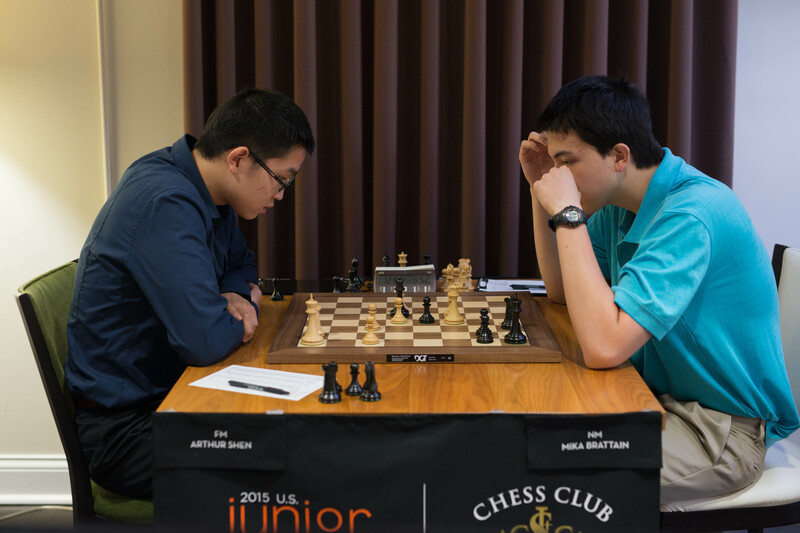 Going into the game, Mika Brattain, along with Xiong, was playing the most solid chess of the tournament. His Caro-Kann opening move perfectly melded with his solid style of play. Arthur chose the highly ambitious 3. f3, known as the Fantasy variation. In comparison to most other variations of the Caro-Kann, the Fantasy variation leads to more open positions than usual, often resembling the King’s Gambit. Brattain played the mainline, but Shen added a slight twist to the variation with his move 7. Bd3. It’s more common for White to place the bishop on c4 but some strong players have recommended Arthur’s choice. It keeps the c4 square open for White’s d2 knight and keeps a better guard of the e4 pawn. Brattain handled the opening well and by move 16 had nearly equalized. His move Rc8 was slightly inaccurate and led to a stable advantage for White. 16… Qc7 was a better choice, allowing Black to bring the f8 rook to the defense of the queenside. Brattain could have improved on his 20th move by playing bxa4, equalizing completely. Shen made the most of this inaccuracy and built up pressure on Black’s c4 pawn. White won the pawn on move 27, leaving Black defenseless against White’s powerful central passers. The 31st move was Black’s last chance to try to set up a defensive fortress by exchanging queens. Black may well be lost in this position anyway, but without the queen exchange, Mika had little hope to control White’s dangerous passers. There were a few tricks that Shen needed to avoid, such as 41. Qxf4?? allowing Qxh3 with a perpetual check. Rather than playing this blunder, Shen’s 41. Qd5+ forced the queens off and connected his center pawns. Black couldn’t offer any more resistance and resigned on move 46. This was the third win in a row for Arthur Shen! He joins Jeffery Xiong in joint second place and only a half point behind the leader, Akshat Chandra. That’s not bad considering 3 rounds ago he was a full 1.5 points behind! All eyes were on Chandra going into today’s game. He was leading by a half point over Jeffery Xiong. He was probably feeling quite lucky after narrowly surviving yesterday’s wild game against Li. It appeared that Chandra might be pushing his luck, taking a great deal of time in the opening. It’s possible that he wasn’t familiar with the opening, and as a result took a long time on the moves. This would make his two pawn sacrifice in the opening a curious choice, considering that it is usually most important to have opening knowledge in sharp positions. The game soon reached a repetition even though it looked like Bodek could press. Probably another fortunate result for Chandra. Both players came into this game probably feeling a little unsatisfied with their scores thus far in the tournament. Today looked like a good day for Harmon-Vellotti to get back on track with the White pieces against Han. Harmon-Vellotti repeated his round one variation of the Grunfeld against Han. Han played the opening well and maintained balanced chances. Harmon-Vellotti might have been able to improve on his 20th move by playing Nxc3 but even then it would still be hard to crack Black’s position. Instead, after 20. bxa6 the position was unclear, but both players navigated the unusual position well. By move 43, the draw was certain, and agreed upon by both. The tournament started brightly for both of these contestants. Liou started with 2/3 and Liang started with 2.5/3! Despite the strong starts, both players have struggled and lost rounds 4 and 5. They would both be looking to win this game to have any chance at catching the leaders. It seemed that Liang was planning to play his standard opening, the Najdorf Sicilian. Liou would quickly play a sideline though that is currently increasing in popularity. Liou held a constant advantage for the rest of the game. At some points it was probably decisive but never easy to convert. In time pressure, after a very long game, Liou settled for a draw in a complicated but superior endgame. Li’s game in round five was one of the most memorable of the tournament. He was White against the tournament leader, Chandra, and was crushing his opponent. A few more accurate moves and he would have won a miniature. Unbelievably, the same story happened today but with different opponents. Li was once again White but this time again the top seed, Jeffery Xiong. Xiong played the French defense, which must have been a surprise because Li thought for 10 minutes on move two. Despite being surprised, Li built up a monumental advantage by move 32. All he needed was one more accurate move. 32. Bh7 would have sealed the deal, but instead played Rh8+. A draw was soon agreed.